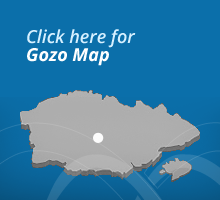 Gharb meaning “west” is the westernmost village in Gozo. On the road from Victoria to Gharb there is an aqueduct built by the British in the early 18940s to carry water from Ghar Ilma to Rabat. Further on in the same direction, one can still see an old fortified country house raised in the 1600s and parallel to this on the other side of the road, there is an old windmill known as tal-Qasam, “of the agricultural estate”. Just before you approach the village a road forks right to the Shrine of Blessed Virgin of Ta'Pinu. The monumental shrine was built between 1920 and 1931./ worth a climb is Ta’ Ghammar Hill right in front of Ta' Pinu Shrine. A Via crucis or Way of the cross made up of fourteen marble statuary groups line the way to the top. There are two small museums related to the Shrine. The first houses the Karmni Grima Museum, home of young country woman who received a message for prayer from the Virgin Mary in the venerated tiny chapel attached to the Shrine. In the village square of Gharb one can also find another folklore museum. The parish church of Gharb is one of the most architecturally perfect churches of Gozo and is designed on Francesco Borromini’s Sant’Agnese in Agone at Piazza Novana in Rome. It was dedicated in 1729 to the Visitation of the Virgin Mary to Elizabeth and beautiful sculptures are to be found both on the exterior and interior. Gharb is a place of intense natural beauty, especially in the area around the ancient chapel of the bishop-martyr San Dimitri. The story goes that after an old woman beseeched the saint to saves her only son from slavery, San Dimitri left the altar-piece on his flying stallion and soon brought back her son Mattew. The altarpiece can still be seen in the chapel.